If you’re familiar with the term ‘Cavalier Servente’ then you'll know it's an old Italian expression used to describe a special relationship a man has with another man’s wife; well this is Italy! Genoa is the city where Byron lived for a year with his: ‘fair as sunrise’, Teresa Gamba-Guiccioli. Byron met Teresa for the first time in Venice and found himself confronted with a young woman determined not only to captivate his attention, but intent on capturing his heart. She was to become Byron’s last attachment, and longest, they were together for over four years. Byron’s pursuit of pleasure has been well documented. His excesses, ‘unbelievable debaucheries’, some have termed, included several mistresses and a harem at Palazzo Mocenigo. He even shocked the Italians being so unconventional and they lay claim to: ‘Il Passione’. Although I think in fairness, for many complex ‘creative’ spirits; surely one muse is essential? So how did Byron come to be Teresa’s ‘cavalier servente’? 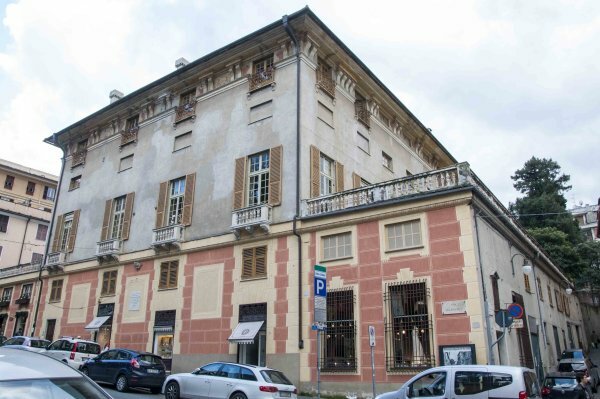 Unable to find lodging, Count Guiccioli, Teresa’s husband, offered Byron (including his daughter and animals), an apartment on the first floor of his Palazzo in Ravenna. In this position Byron was not exposed to criticism since it: ‘Allied him to the most immaculate and respected reputation, of all three-people concerned’. I think I should mention, Count Guiccioli was old enough to be Teresa’s grandfather and brutal to live with. What was the Count’s motive for inviting Byron under his roof, knowing as he did his wife’s inclinations? It was a question Origo* found difficult to fathom; in-spite-of her exacting research whilst writing: ‘The Last Attachment’. She suggests it suited the Count’s purposes in that he could spy on his wife from close quarters, with a view to securing evidence that would grant him a divorce when required. Ultimately, Teresa secured her own divorce, a complicated procedure involving lawsuits at a time when it could only be sanctioned by the Pope. An ugly reminder of the power the Church held over people’s lives barely two hundred years ago. Teresa’s papers, documents written in defence of the man she loved after his death, when she could no longer tolerate the lies being written in Byron’s name, were revealing. I admit to a degree of scepticism when approaching her words. How could any woman who had loved such a high-profile figure remain impartial when recounting her version of passion, ecstasy and pain? Well, my scepticism was unwarranted. At the end of her life, on her deathbed, she declared: ‘The more Byron is known, the better he will be loved’. Gifting her papers to the world and offering a rare insight into the man many have written of, but few, have understood. The treasures, Byron’s ‘relics’ as Teresa called them, lie in the original mahogany box, in a Villa in Settimello, near Florence; bequeathed to her living relatives. There is the locket of her hair, which Byron was wearing when he died and a locket of his hair, which he gave to Teresa when he sailed for Greece. Byron’s handkerchief and a fragment from one of his shirts, a crumbling rose-leaf, with the branch of a tree and a small acorn taken from Newstead Abbey. Marchese Origo gained privileged access to these items and one hundred and forty-nine letters in-order-to write us a Byron not known before. In the end, it was Byron’s need to do more than pen words that led to the painful choice between the woman he loved, or his greater desire to fight in the Greek war of independence. The Greeks won; as history testifies. If he’d stayed in Italy, he would have probably become a hero of their war of independence, as he once said: ‘Only think, a free Italy! Why, ‘tis the very poetry of politics’. Byron was, by reputation, true poet-warrior. If you ever make the trip to Genoa, do head across the city, to Via Albaro. View the stone plaque high up on the gable wall placed in memory of Lord Byron. Take a moment to imagine him standing on the balcony with Teresa as it was struck by lightning in a fierce storm. Or walking down the hill to check on his animals; an area now replaced by a grotesque replica of their Saluzzo above. See if you can evoke the sound of his canter as he rode down to the bay before boarding the ship ‘Hercules’, destined never to return. And the one reminder to this love story, found in the desk drawer of Byron’s writing table, days after he had set sail for Greece? A long tress of Teresa’s hair. I’m sure when he wrote: ‘… But the test of affection’s a Tear’, he’d tasted many.